with Blackberry’s DTEK software, which provides many security features that Blackberry aficionados are accustomed to. Blackberry DTEK50 has a 5.2-inch scratch-resistant screen. The phone’s hardware could be considered fairly “average” among mid-range phones priced around $500. It’s powered by the rather old SnapDragon 617 processor and has 3 GB of RAM memory. The rear camera has a resolution of 13 MP and the front one 8 MP, respectively. Unlike existing BlackBerry phones, this phone doesn’t have a physical keyboard. Hence, it’s similar to most other Android phones in this respect and utilises an “intelligent” digital keyboard. The main selling point is the sophisticated security features. Full disk encryption. FIPS 140-2 compliance protects your private data in case your phone is stolen. Secure boot process. DTEK boots the phone in stages and verifies that each stage is secure before proceeding to the next one. Rapid Security Patching. A characteristic feature for Blackberry phones is the the very fast patching of any security holes. DTEK software. Automatically monitor the OS and apps in terms of privacy and security. DTEK recommends how to act upon various threats and also notifies you about unauthorised phone access. Hardware root of trust. Blackberry security starts at the lowest level ensuring trust at every level. 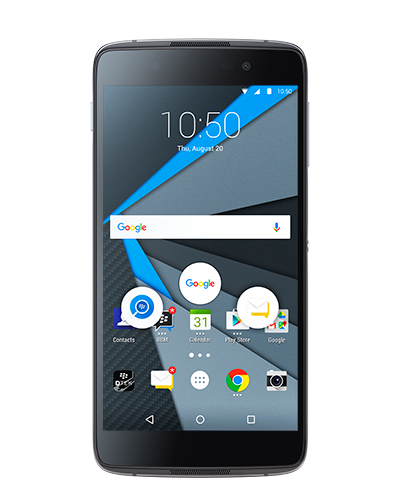 Blackberry DTEK50 is available for preorder in North-America and some European markets and will start to ship on August 8th. We haven’t found any information regarding the release date in Australia and New Zealand and have therefore emailed the company. Hopefully, we’ll have more info to share shortly. The US price is US$299,which converts to about NZ$488 inclusive of GST.